Freefly is known for its five-figure camera rigs commonly seen on the sets of films and TV shows. Now they're bringing their know-how to your iPhone with the Movi Smartphone Cinema Robot. Far more than a simple gimbal, it uses a pair of motors and sophisticated software to elevate your short films. While the standard mode keeps your phone steady during shooting, other modes let it automatically pan from point A to point B, stay focused on a subject while you move around it, shoot stationary or mobile time-lapse footage, and even rotate the camera horizontally to give a wider view of the scene. It communicates with your iPhone via Bluetooth, and is compatible with most cases and add-on lenses. AirPods and iPhones go together like peas and carrots. While the former's charging case is fantastic, it's also yet another thing to charge and carry with you. The PodCase solves this (and several other) problems. Created by ex-Pebble and Avegant founders, it keeps your phone safe from drops while also storing your 'Pods and incorporates a 2,500 mAh battery to keep things charged up. It also works as a USB-C charger for both your phone and the earphones so that you can leave at least one cord at home. It'll be available for the iPhone 7, the 7 Plus, and Apple's new lineup of Fall 2017 handsets. Hang out outside long enough and you'll have your phone overheat. The Phoozy Thermal Phone Pouch uses spacesuit-derived technology to protect your device from the harsh light of the sun. Its exterior is a Chromium shell that reflects over 90% of solar radiation, while a plush core offers drop protection and a soft liner to keep scratches at bay. Available in a wide range of sizes to accommodate most popular models of smartphone. It's hardly the first add-on lens system for the iPhone. The Ztylus Switch 6 iPhone Lens System might be the most convenient, though. Designed for use with the iPhone 7 Plus, its sliding set of six lenses lets you switch between wide-angle, added telephoto, macro, super macro, and fisheye lenses quickly and easily, with no loose parts to misplace. It also has an integrated hand grip for added stability, and a mount on the bottom for a strap to keep things secure. Forever linked to the Back To The Future films, the DeLorean DMC-12 continues to remain relevant decades after the movie franchise elevated it to the mainstream. 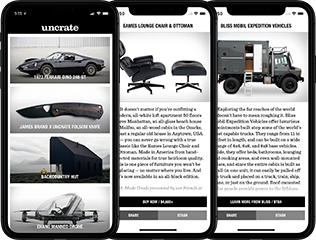 The latest example is a collaboration between lifestyle brand Hex and the DeLorean Motor Company and gives you a chance to carry a piece of the iconic vehicle with you every day. The iPhone case is made from custom molded polycarbonate and features the brushed aluminum and genuine leather that is instantly recognizable. You also get a raised front bezel for extra screen protection, and a laser etched DMC logo on each case. The original Prynt was the first ever photo-printing case. It was also, to put it kindly, rather large. The Prynt Pocket iPhone Printer retains the ability to print out your shots instantly but reduces the size dramatically. Compatible with all Lightning-enabled iPhones, it functions as a camera grip, with a dedicated shutter button, settings dial, and a tray to hold the Zink sticker paper it outputs. A companion app lets you apply filters, add text, and even "attach" videos to your prints that appear in the app when you point the camera at them. Available in graphite, mint green, and a light gray. Nike has a library full of memorable silhouettes. Even the bottoms of some of their shoes are instantly recognizable. These Nike Outsole iPhone Cases let you wrap your precious piece of glass and metal in those designs. Made from durable TPU, they give your phone added protection from drops, bumps, and scratches, all while making your phone easier to grip. Available in two models, matching the outsole of the Air Force 1 and Roche.